Earn $20.37 in Rewards credit (2037 points) What's This? 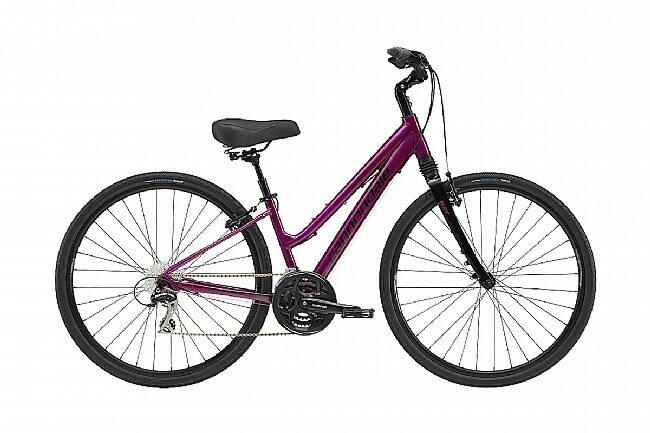 Cannondale's 2019 Adventure 1 Women's Bike features a comfortable upright riding position with an easy reach to the ground. Combined with lightweight construction, bright reflective graphics, and a smooth, stable ride, this bike is ideal for getting around town and working toward fitness goals. Frame: Step-Thru, SmartForm C3 Alloy. Fork: RST A7 Monoshock, 35mm, 1-1/8" steerer. Handlebar: Cannondale C4, alloy, 640 x 50mm rise. Stem: Tranz X Comfort, Adjustable. Pedals: FPD Platform w/Kraton inserts.